Jazz harpist-composer Dorothy Ashby was born Dorothy Jeanne Thompson in Detroit, Michigan, on August 6, 1932, the daughter of self-taught guitarist Wiley Thompson. Raised in the jazz community in the city and tutored by her father to learn harmony and musical instruments, she occasionally provided piano accompaniment for musicians visiting their home. In the band at Cass Technical High School, Dorothy played bass and string saxophone alongside future jazz greats Kenney Burrell and Donald Byrd. Ashby studied vocal technique and played harp in the student orchestra at Wayne State University where she earned a bachelor’s degree in music education. During her years at Wayne State, she also gave piano recitals and sang folk songs on local radio. 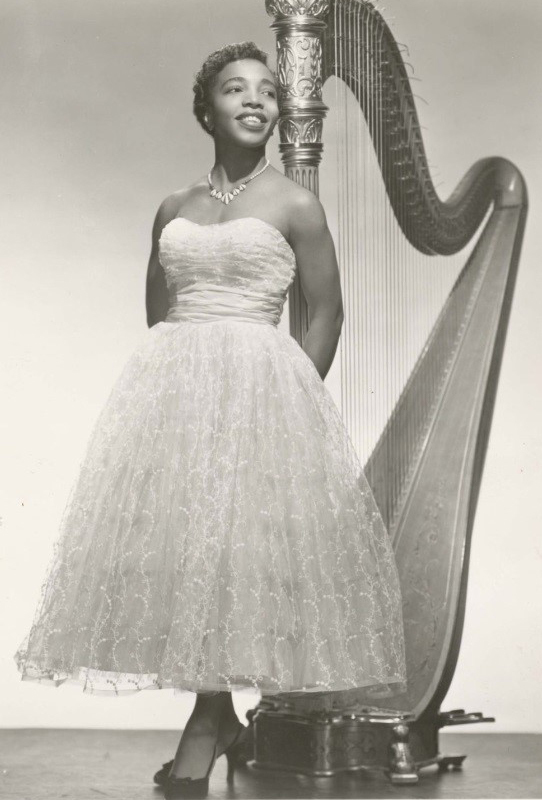 In 1952, Ashby purchased her first harp and had her first professional engagement at a night club in Philadelphia, Pennsylvania. She endeavored to promote the harp, an instrument widely associated with classical music, as deserving a place in jazz ensembles by offering free concerts and performing at such venues as parties, dances, and weddings. For the balance of the 1950s she mostly worked in clubs in Detroit. Her albums were The Jazz Harpist (Regent, 1957), Hip Harp (Prestige, 1958), and In a Minor Groove (New Jazz, 1958). By the early 1960s, she had married drummer John Ashby, hosted a jazz interview show on radio station WJR, and made recordings with drummer Ed Thigpen, bassist Richard Davis, and saxophonist-flutist Frank Wess. She also made appearances with Woody Herman and Louis Armstrong. In its 1962 annual survey, Ashby was picked by Down Beatmagazine as one of its “All-Star” jazz performers. Her albums in the 1960s were Dorothy Ashby (Argo, 1961), Soft Winds (Jazzland, 1961), The Fantastic Jazz Harp of Dorothy Ashby (Atlantic, 1965), Afro-Harping (Cadet, 1968), and Dorothy’s Harp (Cadet, 1969). Ashby’s trio, which featured her husband on drums, toured the nation until the late 1960s when she relocated to Los Angeles, California to further establish her career as a studio recording artist. With the assistance of singer Bill Withers, who referred her to Stevie Wonder in the 1970s, she participated in recording sessions with such premier artists as Diana Ross, Dionne Warwick, Barry Manilow, Stanley Turrentine, Freddie Hubbard, Billy Preston, Bobby Womack, and Earth Wind & Fire. In another challenge to the jazz listening community, in her album The Rubaiyat of Dorothy Ashby(Cadet, 1970), she played the 13-stringed koto, the national musical instrument of Japan that originated in China. Ashby’s last two albums were Django/ Misty (Philips, 1984), with compositions by Thelonious Monk, Richard Rodgers, Erroll Garner, and Ashby herself. In 1984, she recorded Concierto de Aranjuez. Ashby was dedicated to advancing music appreciation and cultural awareness in her hometown. With her husband, Ashby founded The Ashby Players, which showcased African American dramas in Detroit and Canada and gave actors like Ernie Hudson (of Ghostbusters fame) a chance to prove themselves. She also performed with the Detroit Symphony Orchestra and introduced classical music to public school students via special concerts. Dorothy Ashby died of cancer in Santa Monica, California, on April 13, 1986. She was 53. Leonard Feather and Ira Gitler, The Biographical Encyclopedia of Jazz (Oxford University Press, 2007); “Black History Month: Dorothy Ashby, Detroit Legend and Integral Part of Our Music Heritage,” https://2beculturallyexposed.wordpress.com/2014/02/21/black-history-month-dorothy-ashby-detroit-legend-and-integral-part-of-our-music-heritage/; “Dorothy Ashby – An African American Obituary,” https://www.ancestry.com/boards/topics.obits/109307/mb.ashx.